How Do Movers Handle Appliances & Water Lines, or Do They Handle Them At All? Provides personnel for careful, efficient handling of appliances during a move. Every effort is made to ensure that appliances reach destination safely. Assume any liability for the drums on front loading machines. Clients should provide bolts and secure them personally as the moving service provider cannot assume liability of the drum or its ability to function after moving. The owner: Assumes responsibility for having appliances properly serviced, both at origin and destination. It is best to have a reputable service representative prepare appliances for moving at least one day before they are to be loaded on the van. May authorize the moving company to arrange for appliance servicing. This is an accessories or third-party service which will be added to the Bill of Lading as an additional cost or advanced charge. Turn off water faucets, disconnect and drain hoses. Wrap the metal connector ends of hoses in a towel and place inside the washer. To ensure the safe transport of your washer, it should be serviced to prevent swaying of the tub. Regardless of the time of year you move, all water should be drained from the tub because shipments can travel through a variety of climates and terrain. Ask a about third-party appliance servicing. There are more than 20 different washer moving kits available from various appliance manufacturers. The cost for third-party servicing is nominal, especially for the protection it provides to your washer. After your move, be sure to have the washer connected by a qualified installer. Unplug the dryer or turn off the electrical power to the appliance. Remove any debris from the lint screen with your fingers or a dry paper towel. Do not use water on the screen. Wipe off the exterior with an appliance cleaner and soft damp cloth. You can remove dust from the interior with a damp sponge. 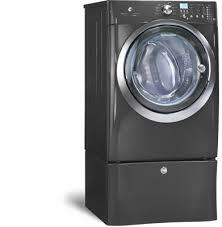 If the dryer drum is discolored, try a mild liquid household cleaner or a paste of laundry detergent and warm water. Rub the area until the discoloration is removed. Wipe thoroughly. Then reconnect to electricity and operate the dryer with a load of old rags to remove any soap residue and to thoroughly dry the drum. Remove the rags when finished. Disconnect the electrical supply to the appliance. For a gas dryer, the appliance should be disconnected and the gas line capped off before moving day by a qualified service technician. At destination, use a qualified installer who is familiar with requirements for gas and or electricity, as well as the exhaust system. Turn off the water and disconnect the water line if you have a cold water dispenser or automatic ice maker. You should also empty the water reservoir. If your refrigerator is an older model, you may need to have the motor or compressor bolted down. The majority of refrigerators now are sealed units that do not require this service. At destination, do not operate the refrigerator for at least 24 hours after delivery. This allows the oil time to settle, preventing possible damage to the compressor. Ice makers and water dispensers must be connected to a water line. Installation service or parts can be obtained from an authorized dealer for your appliance. Copper tubing, a shut-off valve and fittings may be required. Once your ice maker is in service, dispose of the first few batches of ice because of possible impurities from opening a water line. Home freezers were not designed to be used as shipping containers. The weight of food during the move can crack plastic shelves or the molding inside the freezer. Frozen foods are highly perishable. There is no way to ensure that the freezer temperature will remain at a safe level during transit. By not transporting frozen foods, we are helping to safeguard you and your family’s health. Vans have no electric power to keep freezers running, nor can a van operator stop along the route to connect a freezer to a power source. Regardless of the precautions taken, frozen foods will almost certainly deteriorate on a loaded household goods moving van. The lining and insulation of the freezer can absorb bad odors from spoiled food which may be impossible to eliminate and render the freezer unusable.